Even in Tenerife, winter should mean a little drop in temperature, but it just seems to be getting hotter at the moment. 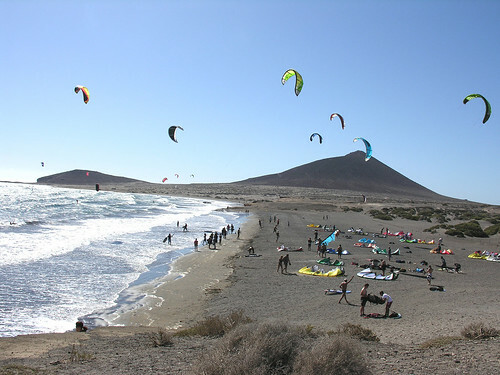 The skies were clear and blue as I headed for El Medano, just past the south airport, this morning, and I was greeted by some wonderous sights as kite boarders and wind surfers made the most of this delightfully windy corner of the island. 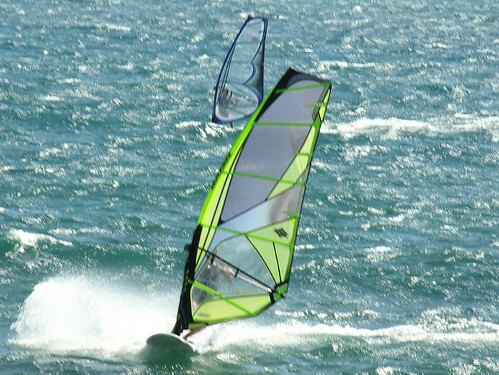 El Medano is a big favourite of mine, a bit of a hippy chill out feel to it and lots of surf dudes communing with nature. It’s been a while sinceÂ I ventured down there, so it was an added bonus to find a health fair taking place in the main plaza, facing the sea. They seemed to be doing a steady trade with health drinks, diet and fitness plans and even some sporadic work outs conducted from the stage. Gently shelving beaches is a bit of a holiday brochure cliche, but it really applies to El Medano, going in from the main beach or one of the coves worn into the sandstone, you can walk out a long way before the fluff in your belly button starts to get damp. Further along towards the imposing figure of MontÃ±a Roja, the sky becomes flecked with multi coloured kites harnessing the wind for the board riders who tug on the threads. 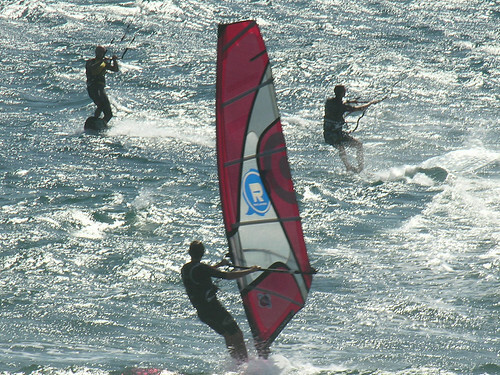 I arrived at just the right time to see many of the kite boarders and wind surfers setting up for the day, and it was quite a spectacle.It’s almost a ballet of boards and kites as they tack into and away from the wind with great skill and strength. many big chamionships are held in El Medano because of the conditions, and a whole support structure of kit and clothing shops has sprung up. Wandering back and along the seafront walkway, I caught the regular market in the far plaza, no doubt tough times for them as well these days but it’s another attraction that draws people down to this area. The Hotel El Medano and it’s very English looking pier, are still standing firm, despite constant threats to demolish at least the pier for breaking the coastal protection law. Granadilla council do a good job on looking after El Medano, there are plenty of informative boards along the front about the flora and fauna, and some history of this stretch of coast. Bins the length of the front have been set up to keep differnt types of rubbish seperate and easier for recycling, and the small exercise frames attract a regular stream of curious test pilots. 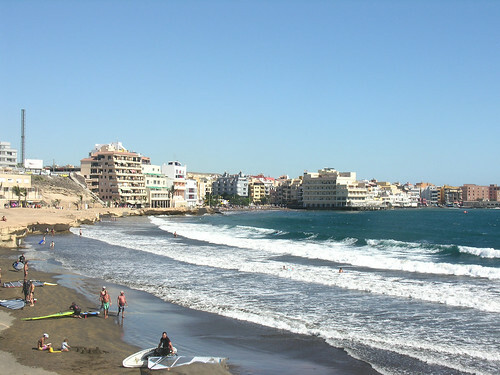 El Medano is very much at peace with itself, even the low flying planes from Reina Sofia airport fail to detract from the overall feel of serenity.Â The sporting exploits on the sea Â give the resort a claim to fame around Tenerife, let’s hope the breeze continues to lift them to new heights. Do we have friends in low places or what?Â Barely a few days after Â www.tenerifemagazine.com becoming Tenerife’s first online magazine, the Tenerife government announced they will lay a new telecomunications cable on the seabed between Tenerife and the Spanish mainland. This work, costing 68 million euros, will start this November, and we are promised it will herald faster and cheaper communication with the outside world. Yes, this new fangled internet thing looks like being the way forward,Â I may even have to join the modern world myself and ditch my 8 track cartridges and Betamax video player. 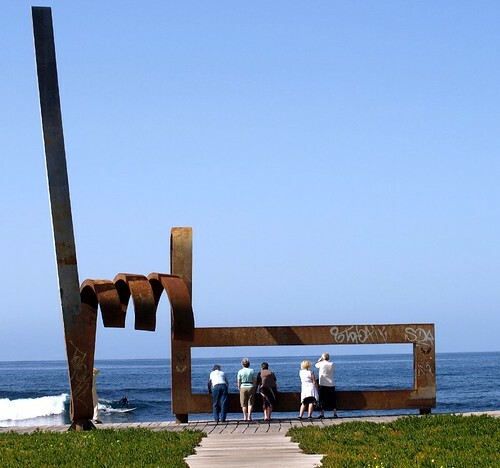 And so it came to pass that a group of Tenerife writers decided to pool their expertise, and with the technical nursing of Sorted Sites , who are pretty damm knowledgeable about social media, set up Tenerife’s first online magazine. The aim is to deliver fresh, crisp, original articles about life on this wonderful rock, and we have a strong team. Joe Cawley has written for just about every major UK national newspaper and penned the book “More Ketchup Than Salsa”. Julie Hume is a must read blogger on ETenerife.com, Jack and Andrea Montgomery wrote “Going Native In Tenerife” and Real Tenerife Island Drives“Â and there is also a blonde, football loving beach bum that you may know. Unshackled by print deadlines, we will be constantly updating the site and you can get invloved through our Facebook group, Twitter and Flickr. Joining the Facebook group will allow us to nudge you when new articles are added, and ensure you don’t miss out on our competitions, the first is to win a fabulous weeks holiday in Lanzarote at Sands Beach Resort Hotel -Â I had a week there just over a year ago and have been singing it’s praises ever since. This does of course meanÂ I will be lurking even more around Tenerife chasing interesting stories, but as i enjoy exploring, it will be a continued pleasure. Chomping at the bit, pulling out all the stops to nail a regular first team slot – that’s what I was hoping for from a much changed starting line up in the Copa del Rey 4th round, first leg at Celta Vigo last night. Sadly it didn’t turn out that way, a 2-1 defeat should be easily overturned in the home leg, but this was not an impressive display. Tenerife started without Nino and Alfaro, preferring Ayoze (pic), Omar, Angel and Dinei as the forward options, but CDT struggled to get over the half way line in the first half hour. Luis Garcia in goal was tested and plucked out a few high balls, often his weak spot, Saulo shot wide after just 3 minutes as Celta looked to conradict their lowly second division placing. Richi had a decent chance from a break but shot wide in a brief respite from Celta’s attacks. Saulo got his goal after 20 minutes, catching the Tenerife defence off guard, another wave followed, this time Michu headed home to make it 2-0. Celta were rampant and our thoughts went back 24 hours to Real Madrids 4-0 huniliation at Alcorcon. 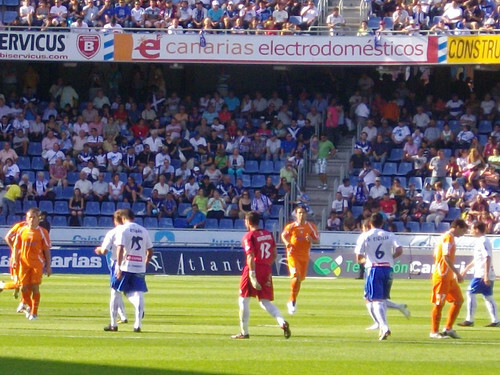 Tenerife managed to rally and put some pressure on their hosts. Ayoze put a good cross in and Richi rose to head the ball in the net on the stroke of half time-phew. The blanquiazul were a little better in the second half, Angel couldn’t carry on after earlier treatment for a nasty gash on his leg, Saizar replaced him for a new forward combination. Arthuro missed an open goal for the home side just before the ineffective Dinei gave way to Nino after 76 minutes. Celta tired but Tenerife couldn’t level the game, Juanlu went close with a header and Saizar hit the post in injury time. The away goal could be vital, but a more convincing performance would be appreciated in the second leg. Like a naughty teenager, Tenerife were just pleased to get the first leg over. CD Tenerife win ugly, but it’s 3 points! Last seasons 2-0 home win over Xerez was the best game of the season, but times have changed for both promoted sides. Xerez arrived with a tight 5 man defence and no appetite to play football, while Tenerife huffed and puffed but again lacked firepower, the eventual 1-0 win was not pretty but the points were very welcome. 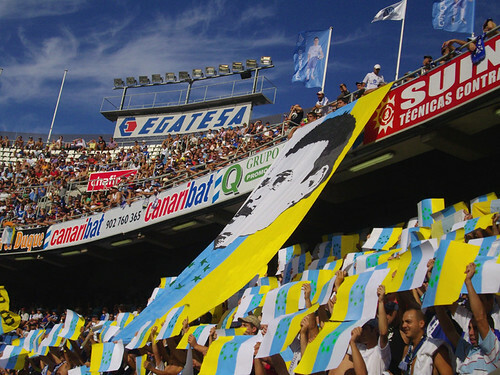 The players ran out to a sea of white, blue and yellow, part of the 45th anniversary of the Canarian Independence flag, and for the first half Tenerife were the only side in it. Changes in defence saw Manolo and Sicillia resume their central partnership with Bellvis and Nunez filling the full back slots. The defence had little to test them as Xerez sat back and tried to block the midfield. Roman went close after 5 minutes and Nino spurned a clearer opportunity near the half hour mark. Everyone was willing Nino to hit the net and revive his form, his team mates were clearly aware of his desperate need for a goal and tried to set him up but too often the final touch was a bit slow in coming. CDT showed some good build up play with Kome and Roman sparking in midfield but Xerez were a tough nut to crack. The second half was pretty dire, Tenerife lost their way and their passing became sloppy, coach Oltra tried to pep them up and the introduction of Omar after 61 minutes, and Angel just after,Â gave them some new life. The goal came from a move down the left, Bellvis started it off feeding Omar out wide, he flashed in a cross and Alfaro was there to meet it with his head, the crowd cheers were as much of relief as joy. 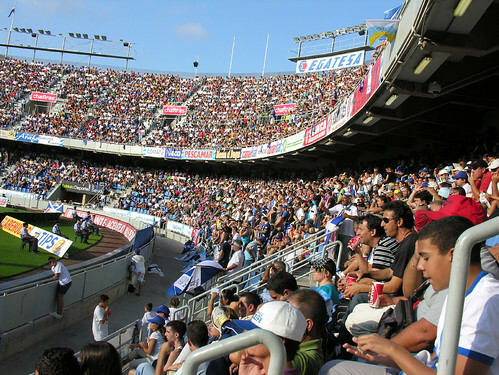 Tenerife held on against their poor visitors to seal victory in front of a slightly dissapointing 17,754 crowd. It’s a busy week ahead, Monday is awards night in Madrid,Â Oltra, Bertran, Ricardo, Alfaro and Nino are allÂ in the frameÂ at the LFP (players union) presentations for last season. Nino has to be extra versatile as at a seperate venue acrossÂ Madrid he will receive his Pichichi award for Segunda top goal scorer. Then on Wednesday night, it’s theÂ away leg of the Copa del Rey against Celta Vigo. Back on the rock and ready to roll, time to check out what has been going on in my brief abscence, heading north to Santa Cruz on the 111 Titsa, a quick chage to the tram and I was in La Laguna to check out the Chinyero exhibition. 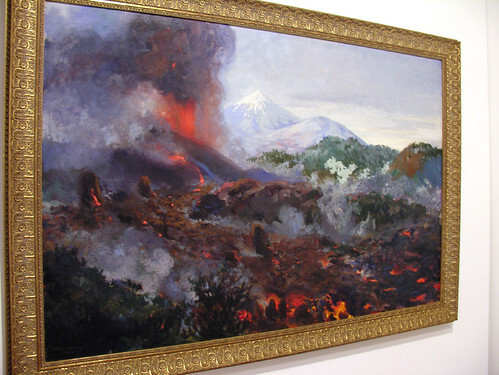 On November 18 it will be 100 years since the last volcanic eruption, in the north west corner at Chinyero, and Instituto Cabrero Pinto in Calle San Augustin has a FREE exhibition about the eruption and volcanic activity across the Canary Islands. Plenty of old pics, records and detailed reports, help to shine a light on this momentous event for Tenerife. The show closes on November 1 but re-opens in Puerto de la Cruz from November 13 to December 17, at the old convent of Santa Domingo. La Laguna was in fine fettle, there is an active effort to improve the streets and plazas as it celebrates 10 years of being a UNESCO natural heritage site. Work on the fire damaged Cathedral palace is moving on quickly, but the ducks around the pond seemed unflapped by it all. I’m not to sure about the addition of a “Noddy train” around the old historic streets, but it’s one way of keeping the tourists happy. Back on the tram to Santa Cruz and christmas was creeping in, well they were putting up the lights in the main shopping streets – already!Â I was hoping to see the group of 11Â Tibetan monks playing at Plaza del Principe, raising money for the Sera Jhe monastry in India, but they were having a spiritual tea break.Â During the last week, SantaÂ Cruz has been hosting the Tenerife DesignÂ Festival at various outlets, one of them being TEA arts centre opposite the African market.Â The Flying Grass Carpet had landed outside the TEA entrance, an artificial grass, instant park measuring 25 x 36 metres. 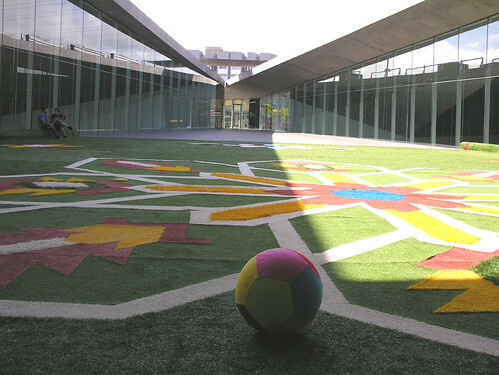 A few people were spread out and enjoying this inspiral carpet, maybe it should return for Carnaval and we can see if anyone rolls it up and lights it. TEA is just about to celebrate it’s first birthday, and as part of the celebrations they have 2 new English language films showing FREE (normal film price is 4 euros). Michael Moores Sicko is on October 30, 31 and November 1 at 7 and 9.30pm, and Quentin Tarantinos Inglorious Basterds is on November 6, 7 and 8 at 7 and 10 pm, both well worth a look. For me though it was time to head back south, there is always plenty more to see in Santa Cruz, but thats for another day. Another frustrating away defeat for CD Tenerife, this time by 2-1 at Espanyol, and once again they came up short in key positions. Just to really wind me up, a few of the stupid short sighted local Canarian barsÂ only realised at the last minute that they couldn’tÂ get the pay per view game, one even had it advertised and then tried to argue that it was on an hour later, mainland time, don’t they even know their own time differences? Good job myself and the other 3 Brits could rely on the Royal Oak 2 just down from CD Marinos ground in Las Americas, a speedy drive and we got to the Armada Sur watering hole with 20 minutes gone and the score at 1-1. Uruguayan Ivan Alonso hit a great strike after 11 minutes to put the home side ahead and Alfaro got his first of the season for CDTÂ 3 minutes later, a rasping long range shot that nearly tore the net open. Tenerife were getting as good as they got but the defence was its usual jittery self, Pablo Sicila struggling out of position at right back. Sergio Aragoneses was immense in goal and made a world class double save, tipping the ball up with an outstretched hand and then twisting back in the opposite direction to firmly claim it as it threatened to spin over the goal line. Kome (pic) was making his usual incisive runs but sadly there was noone on the end to take advantage. Nino was again looking lost up front, short on pace and confidence and even Alfaro failed to be ignited by his great goal, firing wide just into the second half. Espanyol grew stronger with Alonso looking a class act, Marques skinned Sicilia and crossed the ball to Alonso, and with Luna to slow to intercept, he fired Espanyol ahead. Tenerife tried to add extra spice to the forward line with the introduction of Saizar and Dinei, Nino had a late chance to tie the game but even a barrage balloon wouldn’t have been enough to help him score. The search for the first away point continues. 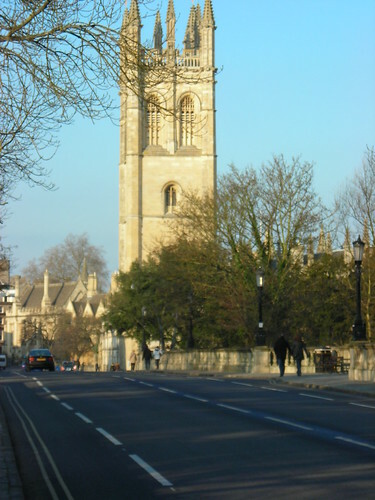 Oxford – it always ends in beers! Back on the rock and collecting my thoughts through a dissapating haze, I feelÂ I should at least sketch in a few details of the oxford leg of my short UK tour. Lack of easy internet access, a moody camera, and most of all large quantities of real ale meant I neglected my posting duties, but it was good fun. Luckily it didn’t rain much but most days started with a frost, making my walk into the city centre, about 3 miles from my parents, chilly but bracing,Â I could have got a bus, but denied my regular swimming, it meant I still got some daily excercise. I like to see what’s changed in Cowley and in the approach to town, mainly more pubs closed and more bargain stores opening, there were a few other pleasant surprises, posh leggy students on bikes are always distracting, and a young ladies lacrosse team heading down the High Street filled my mind with images of St Trinians. As always I spent too much time sampling the ale, winter warmers abound at this time of year and a few bottles of Youngs Banana Bread Beer at 5.2 % had me looking all yellow and bendy. I could have taken up other temptations, a Wednesday night concert by The Proclaimers at the O2 Arena might have been fun but I passed it by. The big finale for my final night should have been The Oxford Beer Festival but a little too much practice in the day meant I retired early feeling tired and emotional. I did bump into quite a few visiting CAMRA (Campaign For Real Ale) fans during the day, although I find it a little excessive how they all start jotting down notes about each half they try of a new unticked ale. So it was a hazy early set off for me to Gatwick Airport, and just a few quiet beers before flying. The main pre check in bar contained the Northern Ireland under 20 football squad, on their way back from the World Championships in Egypt, they were well behaved, but amused, like everyone else, by theÂ young chap inÂ just a pink mankini, no doubt off on a beery lads trip – well there would be no need to ask him to empty his pockets at customs. Â Maybe next tripÂ I can fly in and out of Oxford, Kidlington Airport on the edge of Oxford, mainly a school for young pilots, is about to launch its first commercial service with flights to and from Geneva, in line with various other airports that are miles away from London, its new name is London Oxford Airport – well it’s only about 52 miles away. Anyway it’s good to back in the land of Dorada and 30 degree sunshine – I feel a punishing schedule of swimming coming on to kick start me back to rude health. Kept in a strange village and chased by a huge white clear bubble, sounds bizarre, but myself and many people in the 1960’s were glued to ITV series The Prisoner. 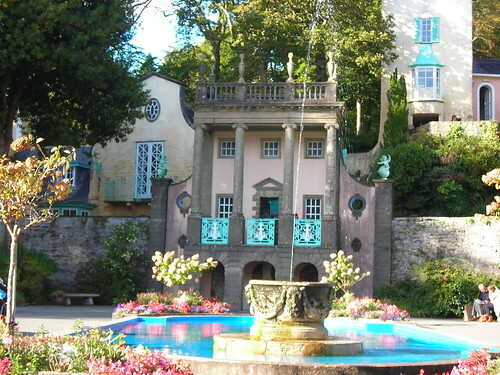 As I am over in the UK for a few days it seemed a great idea to visit Portmeirion in North Wales, where the classic series was filmed. Even staying with the lovely Pam in Bolton, it’s a fair old drive so we took it gently, and as the sun was shining, that made things a lot easier. 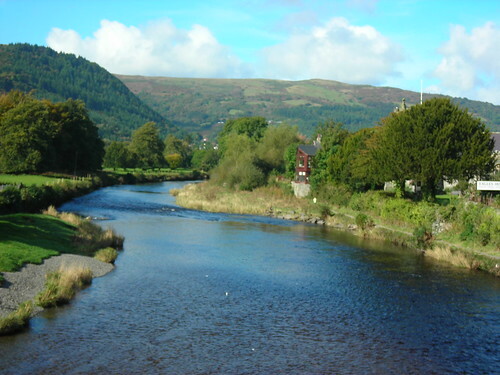 Heading toÂ Pwllheli for a couple of days, we stopped off at Llanrwist (above) Â for a cuppa, a beautiful setting in the Snowdonia National Park, the trees were just putting on their autumn clothes of russets and golden browns and the old stone bridge gave great views of the cold river trickling underneath. Moving on to Betws Y Coed, we could see the little village was a busy crossing point for walkers, the weather was still crisp and sunny as we headed towards the train station. Now I’m not a train spotter, but I should imagine they really blow their whistles when they see the old train carriagesÂ in a siding, used as a buffet coach. There is also a small kiddies train on a single trackÂ , I was tempted but it was clearly not meant for heavy loads like me. The food was good on board, and we even sneaked a quick glance in the railway museum. 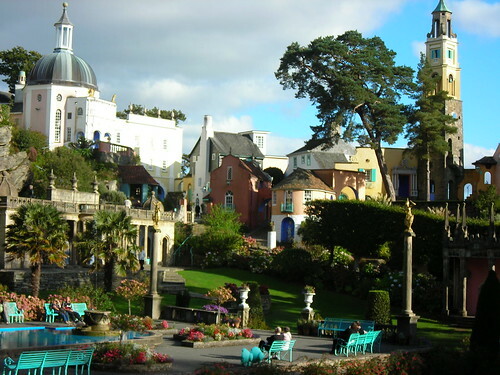 A few miles on and we found the main attraction, Portmeirion (below) , a real mixed bag of architectural styles built by Clough Williams Ellis, around an old run down hotel on the edge of he river estuary. For those not familiar with The Prisoner, there is a new working of the classic starting on ITV in November with a strong American flavour and filmed at a special village built in Africa. For those who don’t know, The Prisoner was a former British agent who resigned and was then gassed, only to wake up in this strange village with no means of escape. Everyone was known by a number and the elusive big boss, Number One, stayed hidden in the background as Number 6 was probed to find out why he re-signed. Portmeiron is certainly strange, it started with just a few large scale set piece buildings and gardens, gradually more architectural oddities in various styles were added by donations, the finished product is pretty amazing. Cardigan Bay forms a wonderful natural backdrop, and the hotel and series of small apartments and chalets are available for holiday rent, there was a big wedding going on during our visit. As the sun stared to sink low,Â a chill gripped the air, time to head off back to Pwllheli. It was a shame not to be chased by Rover, the white ball that acts as a guard dog, butÂ I will look out for it in the new series – somehow I think it will be replaced by something more modern – that’s progress I suppose. It should have been a day to remember for CD Tenerife coach Jose Luis Oltra, his 90th game in charge, beating a record dating back to 1972, but instead he was left to worry about his teams lack of goals. Just 3 in the first 6 games after this 1-0 home defeat to Deportivo, and some real sitters again went begging. Defence was the problem pre game, Oltra had to shuffle his small pack to cover for a long term injury to Marc Bertran and a knock for Manolo, but the defence were fairly untroubled in the first halfÂ against a less then impressive Deportivo side. Roman had 2 early goal chances and Richi put his shot over the bar after Nino set him up. After half an hour Nino put his shot wide with the goal at his mercy and Alfaro ended the half squandering an equally clear scoring chance. Last season goals flowed easily for Tenerife, Nino and Alfaro have not become bad players overnight, but defences in La Liga are meaner, quicker and shrewder, and both players are struggling to adapt. Deportivo came back out looking hungrier and another set piece goal gave them the lead, Colotto finding himself unmarked from a corner. After that the visitors shut up shop and sat on their lead, as the game wore on they wasted time at every goal kick and their players hit the floor and writhed around at every opportunity. Coach Oltra is always willing to push forward and brought on Dinei and Omar for Nunez and Richi, but it didn’t produce the goal spark. Roman picked up the booking he needed to ensure he is suspended for the away game at Espanyol, his loan deal prevents him from playing in that one anyway. Nino was denied by the Deportivo keeper and Alfaro headed wide as the minutes ticked away but there was no way back. Tenerife played well again, dominating the first half, butÂ Â its extra shooting practice for everyone in training this week.